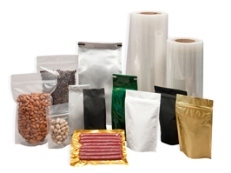 Flexible packaging includes but is not limited to Stand-up Pouches, Poly Bag, and Roll Stock items. Laminated pouches are a great way for brands to create and gain attention with a high-end packaging solution for their product. They can be used for solids, liquids, and Powders. Bags and pouches are available in a variety of materials, including polyester, paper, foil, metalized, and nylon. Additional options include high-gloss and matte finishes as well as Zip, spout, or convenient closures to add value to any product. Additional special features may also include atmospheric shelf life, 3 side bags, and side-gusset pouches along with all types of hang holes, spouts, one-way valves, micro-perforation vent holes and more.